Innovative robots might be old news to you by now. Yes, yes, we know they’re looking creepily lifelike, are becoming incredibly dextrous, and their AI (artificial intelligence) is growing. But let’s get to the need-to-know information – when do we need to start stocking up food cans for the upcoming robotic uprising? I’d put my money on R2-D2 and his kin any day. but that’s only because of Daryl Dixon. overthrow the human race and zap any survivors into the Matrix? Assuming we haven’t already been of course. Well, sooner rather than later it seems. the increasingly pivotal role AI is playing in the smartphone industry, or because Skynet has already been built in the desert. which was advertising free consultations for botched robotic surgeries. In other words, it’s now understood by certain people (let’s call them “lawyers”), that there is already an industry need to protect the public against complications as a result of robotic surgeries. That someone can stand in front of a camera, and without a sense of self-conscious irony inform the public that they can expect to be legally protected from robotic surgeons, as if this were a completely everyday thing, strikes me as peculiar. Whether you’d call it 21st century ambulance chasing or a public service, there is now a market for legally navigating the relationship between humans and robots. Nonetheless, I felt like I had time-travelled to a future where I was lying on the sofa late at night, watching television and too lazy to change the channel (pretty much what I do now, except the sofa hovers mid-air or something). Half asleep, the budget legal ads come on, offering legal services to protect humans against robots not playing fair by Asimov three laws of robotics. So if robotic aid is already this integrated and accepted into society, where will we go from here? If your curiosity has been piqued by the mention of robotic surgeries, and you have not yet heard of them, let me enlighten you. Operating theatres around the world are making room for our robotic “inventions” (progeny? 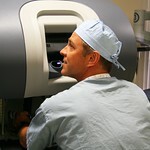 ), who are very well-equipped to handle complex surgeries. Some might say too well, as what I remember from my history textbooks, the term “mechanisation” is usually followed by a description of mass unemployment. But fear not, medical profession, we’re assured that the robots are there to “enhance” human surgeons, not replace them. For now. a robot controlled by a surgeon behind a console. which are capable of a level of precision no surgeon could rival (and we thought our opposable thumbs were the height of evolution). The Da Vinci robot is precise (watch it peeling a grape) and dexterous (now watch it do origami). Further, it undergoes thousands of quality checks during every procedure, and is able to sense and make compensations for human tremors. The human hand can’t keep absolutely steady, and although surgeons can reach a great degree of control, there can still be that very slight involuntary movement. Not so for iRobot. Despite what the ambulance chasers might have you think, the complications that do arise are more likely as a result of human error. 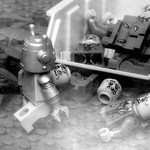 And so, the situation seems to be more the case that it’s humanity keeping robots back. Hopefully, not too soon until the robots realise that. So until AI technology kicks up a gear, there doesn’t seem to be any reason to fear our scalpel-wielding android surgeons. Until that time, do yourself a favour and check out How To Survive a Robot Uprising. It might save your life in the near future. Queenie Bates is an avid reader and writer based in Cape Town, South Africa.